We supply a wide range of wholesale breakfast products for business and trade - from wholesale cereals and wholesale cereal bars, to jams and spreads. 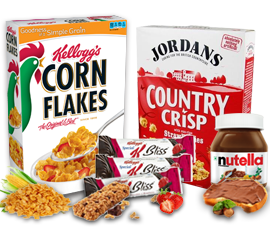 Great deals on popular breakfast products from known brands such as Kelloggs, Nestle, Jordans, Alpen, Nutri-Grain, Special K, Weetabix, Nutella, Marmite and Hartleys. We carry a large stock of wholesale breakfast supplies ready to buy for next day delivery to your business.